I am giving away 12 Exclusive Sessions including a 7inch Print! So if you'd like the the chance to WIN the ultimate Portrait Experience, fill your details in below and we'll get in touch to get you booked in! For 1 day on Monday 29th October i am transforming my studio again into an Enchanted Woodland for boys and girls to explore and enjoy. This is your child's chance to become a real fairy or elf for their very own magical limited edition Portrait Experience. I offer the Enchanted Fairy Workshop for girls and boys aged 7 months -12 yrs. All costumes and props are provided and chosen to compliment the quality and ambiance of your childs portrait. Girls will love the choice of beautiful fairy dresses i have with their vivid plums and pinks giving an abunence of colour to the woodlands foilage, toadstools and glisening pond. For little boys, who'll love to sit and fish from the bridge, i have cute green outfits and matching hats which look absolutley adorable! I would advise when booking your session, you avoid nap and snack times so I can get the best possible images for you. Your session fee includes up to 3 Siblings so if you have more than one child you can be sure you'll get gorgeous images of them all together and individually. If you have more than 3 children please do get in touch as there is always something we can do for you. We'll set a date for your private viewing and ordering appointment, for you to come and choose which package you would like to order...most mums and dads chose to order their images digitally, so they can print to their hearts content and take care of all of the family and friends Christmas presents. Orders are only available on the day; so please speak to partners, grandparents, and other family members before the day to see what they would like, better still why not bring them along so that they can see the photos, share the experience and choose their favourites with you! 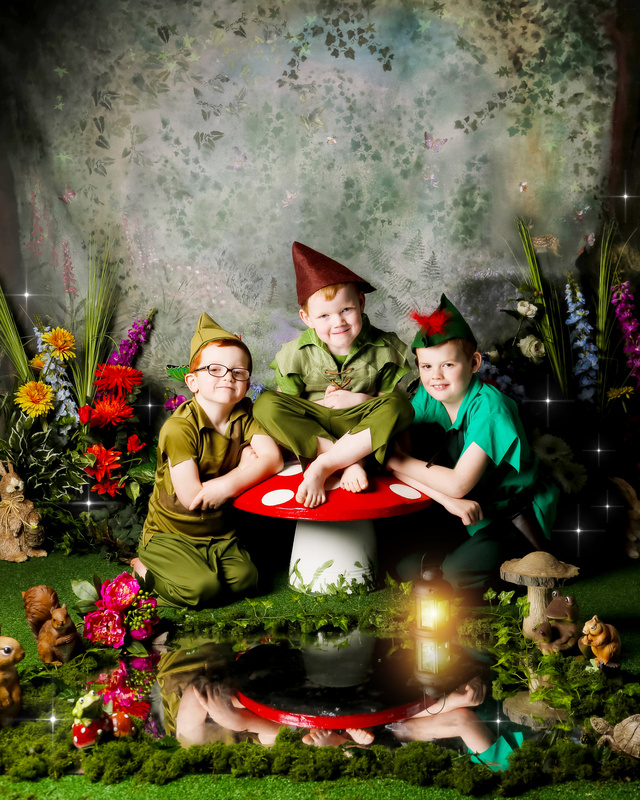 A £35 booking fee ensures your child's shoot in the Enchanted Woodland and this is up to 3 children. Your more than welcome to share your session with family as long as its no more than 4 children altogether. By doing this you could then share a picture package if you wish to. Products range in price from £45 for a large 10x8 print for independent framing, to £595 for a Luxury package of Digital Images with FREE Wall Art. I have created amazing packages for every budget. There is no obligation to buy anything, but im sure you'll love them all .